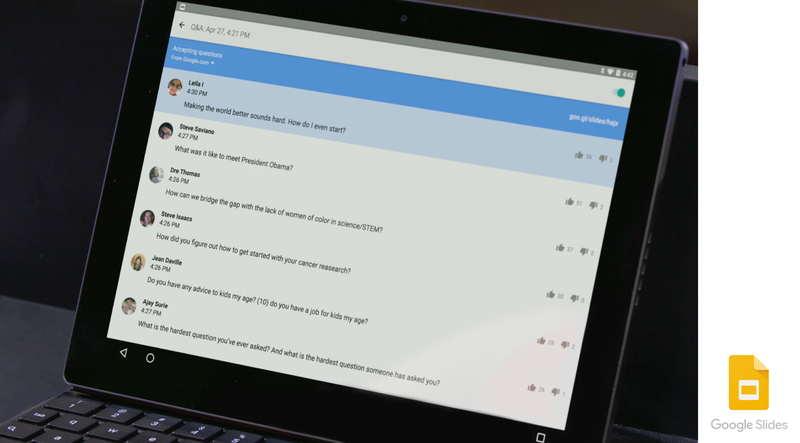 Google is launching Slides Q&A today, a new feature for Slides, its PowerPoint competitor. With Slides Q&A, presenters can get questions and general feedback from their audience — and audience members can vote for their favorite questions. Slides Q&A is rolling out globally today. Presenters who want to use it will see a button in the Slides presenter view to kick off a Q&A session; on mobile, this feature will be behind the “audience tools” button. After that, a link to the custom Q&A for this presentation will appear above the presentation. Google says it recently tested the new feature during a presentation by Google Science Fair winner Shree Bose at its New York office. Her talk in front of 200 middle-school students generated 170 questions. While this was probably not your typical audience, I can definitely see how this feature could make more efficient the Q&A session after a presentation, especially at events where you can assume that everybody in the audience has access to a smartphone or laptop. Not everybody wants to walk up to a microphone and ask a question in front of a huge audience, after all (and the people who do are often a bit too happy to be in front of that audience…). Other tools like Social Q&A or text-message voting services like Poll Everywhere can also bring similar Q&A features to any presentation, but these solutions are often a bit pricey and aren’t quite as well-integrated into a tool like Slides. If all of this looks familiar, by the way, it may be because Google once offered a tool called Moderator. Before it shut down in July 2015, Moderator offered a similar crowdsourced Q&A service, though with a focus on gathering questions ahead of major events. Besides Q&A, Google also added two new features to Slides that should make giving presentations with the service a bit easier. The first is the ability to present slides to Hangout from an iPhone and iPad; the second is the introduction of a virtual laser pointer on the web for those who present from a computer. The updates are rolling out globally to the Slides apps on iOS and Android now.